MSI has been teasing its VR backpack for a while now, showing off the awesome concept at Computex in June. The company has now revealed the final product, known as the VR One. MSI's interesting VR One is a backpack gaming PC that weighs just under 8 pounds (3.6 kg) with batteries installed, and is powered by an overclocked CPU and NVIDIA's new GeForce GTX 10 series graphics card. 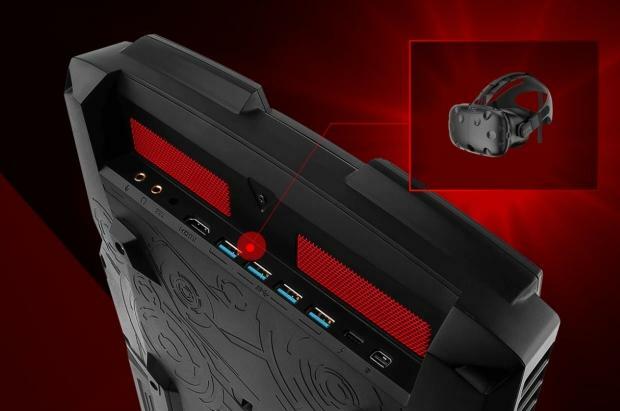 MSI adds that the VR One features an HDMI port, mini DisplayPort, Thunderbolt 3/USB Type-C and 4 x USB 3.0 ports. There are 2 x 90mm fans and 9 heat pipes that will keep the backpack cool, with just 41dB of noise. VR One also includes dual hot-swappable batteries that will provide just over an hour of intense VR gaming. MSI hasn't provided too much more information on VR One, so we don't know what price we're looking at for the gaming backpack PC, but it's reportedly already in mass production, with units available next month. Now that's one hell of an idea, leave it to MSI, if they could somehow incorporate vibration into it it will sell like crazy! Weight seems a little heavy at almost 8 LBs, can you use it as a desktop as well? I hope the price will be attractive. hopefully less than the price of a Vive. Yes you can use it as a desktop computer as well, the vibration feedback is actually a great idea, maybe the price will be high because it has to be a high specs computer, but it will be also you main computer. HP and Dell have also backpack computers for VR, I posted a thread about it and with the first model of the MSI backpack. I love the idea of these, but I doubt they will last long. Great if you are setting up a longer experience for people, though, so they could gear up like we used to have to for laser tag. Maybe it will be more for some particular activities and places. I think if the price is the right, it may be a pretty good option for thos like me which use a laptop even when never unplug it or move it. I like that builds like this will allow you to set up demo spaces quickly, but feel like the new TPCast wireless modules will make these generally irrelevant. Tell Us About Your VR Setup!